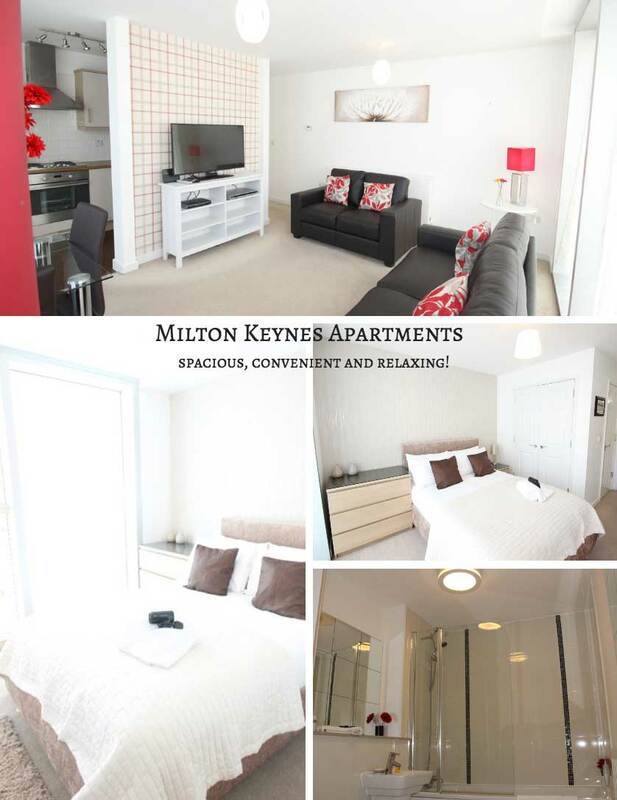 Milton Keynes apartments are suited to stays of a couple of nights or more with the flexibility of extending it. The unique features of this type of serviced accommodation include more space, more freedom and more convenience for a similar nightly, weekly or monthly rate. There is however, greater potential for cost savings versus booking a Hotel stay of a few nights or more. How do Milton Keynes apartments compare to a Hotel room? This does depend on whether you book into a Studio serviced apartment, or a one to three bedroom. For the majority of bookings a serviced apartment are far more spacious with the living area alone being the size of the average Hotel room. For twice the amount of space at a rate similar to a Hotel room of equal standard, you get a fully equipped kitchen, living room with dining-table, TV and sofa/s, separate bedroom/s and bathroom/s, secure underground parking bay, plenty of storage space and laundry appliances. Many of the Milton Keynes apartments also have a balcony so you can step outdoors and soak-up the views across the vibrant City. What are the benefits of Milton Keynes apartments? More convenience – there is a washing machine, iron plus ironing board and, in many of the apartments a balcony to air your clothing too. This saves time and money on having to use a laundrette or the Hotel laundry service. More freedom – the availability of a kitchen gives the option of cooking a meal or making a coffee as an when you feel the need. All Milton Keynes apartments are located within walking distance to a supermarket or convenience store. This means you don’t have to rely on room-service and the limited meal options they often offer. A well equipped kitchen also gives you the opportunity to save on restaurant charges by eating-in. More space – if you are travelling with a colleague, friend or family the extra space will give a sense of privacy. Bedrooms are separate from the living area. Where do I go to see what Milton Keynes apartments are available? This page also lists all of Cotels Milton Keynes apartments with detailed descriptions of each and a monthly calendar showing availability. How do I book a stay in a serviced apartment? Bookings can start on any day of the week, including weekends from just 2 nights. We have a 24 hour reception desk at all Milton Keynes apartments, so you can arrive any time after 3pm to check-in. Early check-in and late check-out service available if required at an additional charge. Or… contact Cotels to discuss your requirements and they will help you find the apartment that best meets your needs.